will discuss the tools that can help you acheive this. higher level to the smallest details. This is the reason why tools like Discoverer are so popular. The most sought after requirement is to see gl_balances at higher level and then ability to drill either into journal details or directly into subledger transactions. So as you see the sum of all the journal lines is updated to GL balances and this is known as GL-Posting. So now the question is where are these Journal line transactions coming from? Well, we took a lengthy tangent off our initial discussion on how do you drill? There are various ways you can drill. system where tons of transactions are posted to GL from Subledgers on a daily basis this is not the right approach. And this materialized view cannot provide real-time information from subledgers. Going from journal lines to subledgers is a little tricky but it is possible. Each journal line has a journal source and category, so we can use this information to identify which subledger tables to drill into. So if the source is “Revenue” then we know that we need to just query the AR tables. 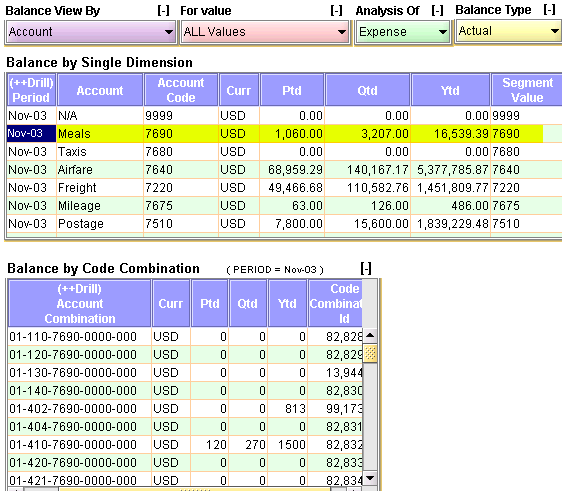 have multiple sets of books and multiple chart of account structure.When you have a different chart of account structure it means each structure has different number of segments(dimensions) and each segment could have different value set than the same segment in a different structure. with this GL Dashboard you can browse any set of books and any chart of accounts. You can dynamically change dimensions and the portlet will show you information for the new dimension in an instant. Define ad-hoc drills into Vendor, Items, customers or any other information you desire. This dashboard is pure plug and play. Just download it and you are ready to go. Before you download the dashboard you need to download the main InfoCaptor setup file and install it. and start creating dashboards. The website has some pre-built dashboards for GL , Discoverer, Sysadmin and DBA. You can create your own dashboards and share it with others.